4/12/2019 • The only military university in the Czech Republic have resumed a project that aims at rising new candidates from among the university students who would get interested in blood donation and entering the bone marrow register. The project renewed after five years should bring more hope in curing the seriously ill people and save human lives with the donated blood. Students received the information of the donating conditions and opportunities at the initial lecture. 3/28/2019 • The graduation ceremony held yesterday closed another two career courses that train the officer for service in the top management positions within the Army of the Czech Republic – 34th combined General Staff Course “Tomas Garrigue Masaryk” and 35th General Staff Course “General of the Army in memoriam Heliodor Pika”. The thirty-five successful graduates completed the courses last week as they had defended their final theses, half of them with honours. 3/15/2019 • The University of Defence hosts the Czech part of FOURLOG 2019 international training event in this week. It is the follow-up of the parts that took place in Hungary and before in Austria beginning on 4 March. 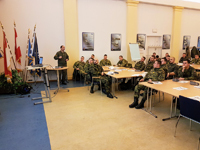 The event is designed for the students of logistics branch coming from the military schools in Austria (Austrian Armed Forces Logistics School), Hungary (National University of Public Services) and Serbia (Military Academy), along with the Czech University of Defence. 3/11/2019 • The flags of NATO has been hoisted next to the Czech national flag for twenty years. The University of Defence gathered today to mark the vicennial anniversary of the Czech Republic's accession to the North Atlantic Treaty Organisation. 3/5/2019 • On March 4, 2019 the annual International Logistics Student Training FOURLOG 2019 has begun.